After all the fun of the fair, there's nothing nicer than to come home, kick off your shoes and relax in luxury. Book this Florida Vacation Rental Villa and you could be doing just that..... sitting beside a luxury south facing private pool to catch the last of the Florida sunshine, raiding the fridge for just what you fancy whenever you feel like snacking, gathering round the table to plan tomorrows activities, perhaps cooking up a barbecue for an al fresco feast on your patio, or lounging in front of the cable LCD HDTV in an air-conditioned room while you recharge your energy levels... In short, enjoying all the comfort of home and more; with all the excitement of Orlando, Florida! The luxury villa is set on a Large Corner lot close to the clubhouse at the much sought after 'Manors at Westridge'. It is a peaceful & idyllic location to return to after a day of excitement at the various theme parks or golf courses. The Great Room lives up to its name. We have upgraded all the furniture offering an exceptionally high degree of comfort and luxury. One of the sofas converts into a double bed so the villa is able to sleep up to 10 people and the patio doors look out on to a very inviting extended pool area. Vaulted ceilings give you a wonderful feeling of space and size. Included in the room is an entertainment centre with a Sony PLAYSTATION 2, cable LCD HDTV, CD player, DVD/Blu-ray, various CD´s & films and a selection of games. We have also added ceiling fans in the Great Room and all the bedrooms, even the pool area which will assist the full air-conditioning throughout the villa. Finally there is a phone available with FREE local, long distance and international calls (up to 100 countires including Canada & UK), also an answering machine is available. The Dining Room is open plan and over looks the Great Room through to the pool area. The large table has been upgraded to add more space for your dining making it a more relaxing & enjoyable experience. The Nook is a breakfast area to us Brits! Luxury Italian porcelain floor tiles have been added and again the furniture has been upgraded so that it is a larger size and better quality. This will make those busy breakfasts before you rush out for the days adventure, just a little easier. It has a lovely view of the pool area. Our kitchen is fitted with oven, microwave, dishwasher, coffee percolator, blender, large fridge freezer & all the crockery, glassware and utensils you will possibly need. Luxury Italian Porcelain floor tiles have been added. This makes it home from home for the chef and can save you a lot of money on eating out. Role in from a day out and just knock up a quick meal you fancy instead of visiting a restaurant. If you have small children accommodating their needs will be much easier. Or if you fancy having a glass of wine by the pool you do not have to worry about who´s driving. We also have a large washing machine, tumble drier & clothes line located in the double garage. This room is especially fitted out to make sure the parents also have their little bit of luxury. Queen pilow top bed. The tray ceiling fan assists the air conditioning, there is also a hair dryer, telephone, cable LCD HDTV and a Blu-ray/DVD that you get to choose what channel is playing. We have also added a comfortable side chair and table by the patio door which gives a lovely view and access to the pool area. A pool door also gives access from the en-suite, quite luxurious. There is a large walk in closet (wardrobe) with plenty of space and a dresser for your other clothes. Lets not forget you also have a large en-suite bathroom with your own private door to the pool area. Luxury Italian Porcelain Floor Tiles have been added. The upgraded shower head gives many different types of sprays to suit your mood, power, champagne, pulse, you choose. Don´t worry about linen, pool towels (some themed for the younger guests) and luxury bath towels they are all taken care of and included free of charge. Now this is the beauty of this villa, it has a second master en-suite. Therefore there are no problems over who gets the master. Second Master en-suite. This room also has a large closet (wardrobe), ceiling fan, hair dryer and yes we have added an en-suite bath room to finish off the luxurious feel. Luxury Italian Porcelain Floor Tiles have been added. The upgraded shower head gives many different types of sprays to suit your mood, power, champagne, pulse, you choose. Don´t forget there is also a cable LCD HDTV with Blu-ray & DVD and a Queen pilow top bed. This room has been decorated to cater for the smaller guests of the party, their own little den. It has it´s own built in wardrobe with special children´s clothes hanger and there are two twin beds that are just as suitable for us big children. We have also added a fun ceiling fan to assist the air-conditioning, nice and cool for when you return from a days adventure. To top it all a Disney themed TV & DVD. This room shares a third bathroom which also has a hair drier. Luxury Italian Porcelain Floor Tiles have been added. The upgraded shower head gives many different types of sprays to suit your mood, power, champagne, pulse, you choose. Our second twin bed room. It has it´s own built in wardrobe and bedside tables to store all your bits ´n´ pieces. We have also added a ceiling fan to assist the air-conditioning, nice and cool for when you return from a days adventure. A portable stereo system adds some ´sounds´ to the room. A cable LCD HDTV and Blu-ray/DVD adds the entertainment. This room is perfect for any age group. It also shares a third bathroom with hairdryer. Luxury Italian Porcelain Floor Tiles have been added. The upgraded shower head gives many different types of sprays to suit your mood, power, champagne, pulse, you choose. Our luxury south facing private pool area is simply fantastic. It has an upgraded pool, fully covered extra large deck area, upgraded pool furniture, towel stand, BBQ, pool heater, ceiling fan and to top it all, it is south facing. On your return from the theme parks, the pool will be waiting to bathe your hot skin in cool water. Just imagine sitting by your own pool in the evening relaxing and maybe having dinner or a snack, simply wonderful. The pool has heating facilities and we recommend that you budget for this during the cooler months between October – April. There is also a pool cover provided to keep the heat in. 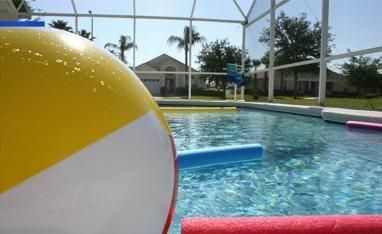 A pool alarm and pool fence provide a degree of safety for children (however old). The pool screen ensures the Florida bugs are kept out and you can sunbath in peace. Further plastic chairs are available for you to use after a dip so you don´t get a wet lounger. Use of the BBQ is free of charge. The front of the villa has motion lighting to assist you when entering the front door or via our electronic garage door. * 2 Phones with FREE local,long distance and international calls (up to 100 countires including UK & Canada). * Upgraded pool furniture with towel stand, fan and FREE BBQ. * FREE Blu-ray/DVD with selection of films in Great Room, Twin Room and Masters, Disney themed TV & DVD in Disney room. * FREE Crib (cot) (x2), High Chair & Stroller (pram). * Security alarm (monitored) Pool alarm and safty fense. * Wet area´s tiled with top quality Italian porcelain tiles. Were fully loaded so don´t miss out on this fantastic villa. Contact us NOW. Air conditioning, Cable television, Charcoal grill, Coffee maker, Deck, Dishwasher, Dryer, Blu-ray DVD Player, Full kitchen, Garage, Microwave, Oven, Refrigerator, Stereo System, Swimming Pool, Telephone, LCD HD Television, Washing machine. Just 10-15 min from all the Disney Attractions. State parks and lakes close by. All the Orlando attractions are within easy reach of our villa. Sarah and I had visited Florida several times before and it is always changing, there is always something new to go back to. We lead very busy lives so we decided to go for a holiday home that we could go back to year after year and have a fantastic holiday and rest. But the adventure is always around the corner. We have met so many wonderful people and made lots of new friends. When we go back the neighbours walk past and wave or pop in for a chat. It is such a great neighbourhood. Located in the Manors at Westridge it is the pefect retreat from the hustle and busle of the theme parks. A beautiful landscaped comunity with security gates and a club house with large pool. With free calls (*see website for T&C) and answer phone. Throughout. Also fans in all rooms and the pool area. For those cooler evenings in with the cable TV on. Luxury 200 thread to help you sleep in comfort. A large dryer is provided to dry out you favourite clothes ready to hit the town... We also have a line in the garage to hang your wet swim towels and gear. 2 spaces with a quiet electronic door opener. Free Wi-Fi with fast connection and dual band router. Nice and fluffy for after a day in the sun. Pool towels are also provided. Available in the clubhouse. Also a large pool for fun or a bit of exercise. Comfortable living area with cable LCD HDTV, sound system and games console. No standing by the sink, just put it in the dishwasher and then go and have a dip yourself in the pool. Nice and big with a pan draw. This is a full kitchen with everything you could want. You can happily cook a family meal here and still enjoy being near the pool. Large solid table to set up a family banquet. You can also use the nook table for more seating. 1 in the great room and a portable 1 in the twin room. Ping Pong is available in the garage. There is a great games chest and table tennis. A selection of music is available for your listening pleasure. There is a great games chest. A selection of films and programms available on Blu-ray and DVD for your use. Simply the best, it is where we spend most of our time. Just 2 mins up the road. Please ask before you book. Luxury with south facing pool. Lots of seating and an outdoor fan to keep you cool. In the club house, nice and big!!! we stayed with two other couples of friends. the purpose main was to come and and find our children who study at the college we had a great time . only fact about the BQ could not be used as a small and fixed. Thanks for your feedback and glad you had a great stay, we would love to have you back again. We have used a 'park style' BBQ for the safety of the villa and the guests. There have been reports where guests have thrown a portable BBQ in the pool, put it to close to the pool netting and set it a light and there are Florida rules and regulations about storing the gas cannisters which we don't want to have the guests worry about. The BBQ does get a lot of use because we give it a deep clean and refurbish each time we are out there. People also love the Mickey Ears we have created for standing on. We enjoyed our stay and loved florida!! My kids enjoyed it. If we come back to this part of florida again we'll be sure to come back. Absolutely loved this villa and location of Westridge. Pool area is fantastic as is the villa which is extremely well equipped. Would have no hesitation in recommending this villa. Owner was extremely helpful with any queries. It was great to have you stay and we look forward to having you stay again in the future. It means so much to us that we can bring the magic to your holiday. Superb villa, great location, immaculatly kept and the attention to detail is second to none. This was our 3rd visit and we will book again as soon as we can. On your return from the theme parks, the pool will be waiting to bathe your hot skin in cool water. Just imagine sitting by your own pool in the evening relaxing and maybe having dinner or a snack, simply wonderful. The pool has heating facilities and we recommend that you budget for this during the cooler months between October - April. There is also a pool cover provided to keep the heat in. A pool alarm and pool fence provide a degree of safety for children (however old). The pool screen ensures the Florida bugs are kept out and you can sunbath in peace. Further plastic chairs are available for you to use after a dip so you don't get a wet lounger. Use of the BBQ is free of charge. The front of the villa has motion lighting to assist you when entering the front door or via our electronic garage door. Other Activities: All the major Orlando theme parks are within a short drive, Disney Animal Kingdom is just 15 min away. Golf: There are many fantastic golf course in the area. One is just 2 mins up the road. Shopping and restaurants are also just 2 mins up the road. Or if you want a pizza there is one available within walking distance. If you want a base for your golf. You will be very comfortable here. When using this system please note that pool heat is an optional extra.